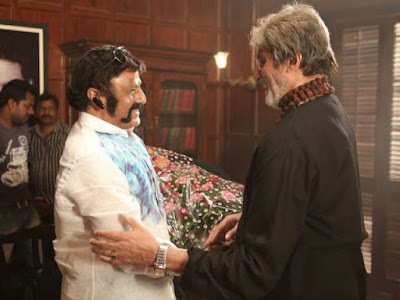 Nandamuri Balakrishna and the executive of his 101st film Krishna Vamsi met Big B was additionally shooting for his new film 'Sarkaar 3' in the Film City. Not long after Balayya got mindful of this, he met senior Bachchan and talked finally with him. Balayya has clarified Big B about his present film GPS and how it was getting down to business. Huge B is heard to have acknowledged Balayya for making the biopic of such a verifiable pioneer. Amid the talk, Balayya has requested that Big B play a character in his new film 'Raithu', which will be coordinated by Krishna Vamsi. Bachchan has as of late said that he has no issue with acting in Telugu movies, yet he needs a testing part and time to take in the dialect. Sr Bachchan has apparently guaranteed Balakrishna to think about his offer.